I may be a little biased, but Scotland has many fabulous photogenic locations. One of the most visited has to be the Isle of Skye. Whilst it is officially an island, it is joined to the mainland by a road bridge opened in 1995. This makes it one of the easiest islands to visit. When you get there you’ll find a photographers’ paradise. There are so many places that will be recognised from photography portfolios that it is difficult to take a shot that hasn’t been done before. For those not familiar with the Isle of Skye, it is an island on the west coast of Scotland. The island has a number of peninsulas which radiate from the mountainous Cuillins. Many visitors to the island will tend to stick to the Trotternish Peninsula which contains locations seen in films and TV programmes such as The BFG, Macbeth, Stardust, The Land That Time Forgot, Snow White and the Huntsman, 47 Ronin, King Arthur: Legend of the Sword, and Transformers: The Last Knight. I am going to be running a private photography workshop on Skye in June. It has been a few years since I last visited so I wanted to spend some time reminding myself of the best spots. I also wanted to try and find a couple of slightly different locations that aren’t on the usual photography tour trail. Over the next three weeks, I’ll share images and locations from this recent trip. We’ll start our photography guide with this famous ridge and hopefully, show a few locations that you may not have seen so often. The Trotternish Peninsula is most famous for the 30km long landslip known as the Trotternish Ridge. The peninsula is underlain by basalt. This is what provides the area with some of the most recognised photography locations. 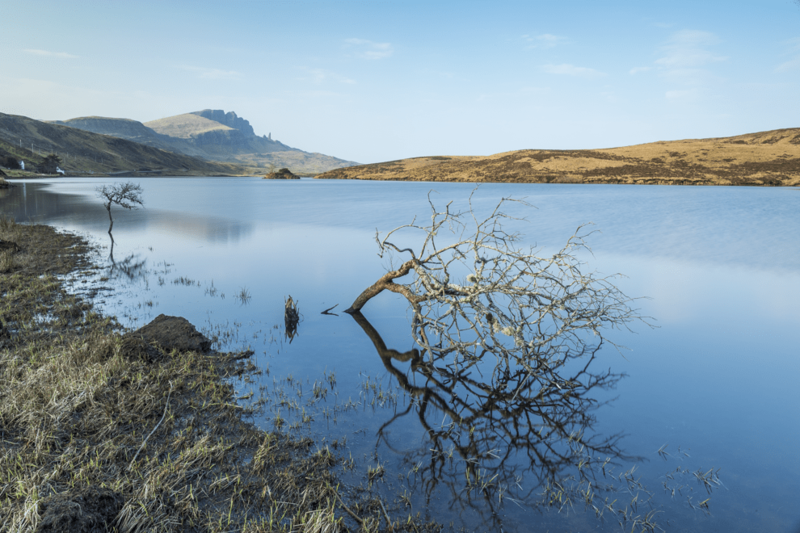 Loch Fada is around 4 miles north from the capital of the island, Portree. Be careful if using a Sat Nav trying to find this location as there is another Loch Fada on the west coast near to Talisker Bay. To get to the side of the loch there is a small parking area by a farm gate. You can then walk through the gate pointing toward the loch and walk down to the shoreline. It is quite boggy so it’s best to wear wellington boots. At the north end of the loch is a view to the famous Old Man of Storr which we will see in more detail shortly. This shot was taken in the late afternoon in April and still had some light hitting it. It also works as a morning location with the sun shining onto the landslip from the east. 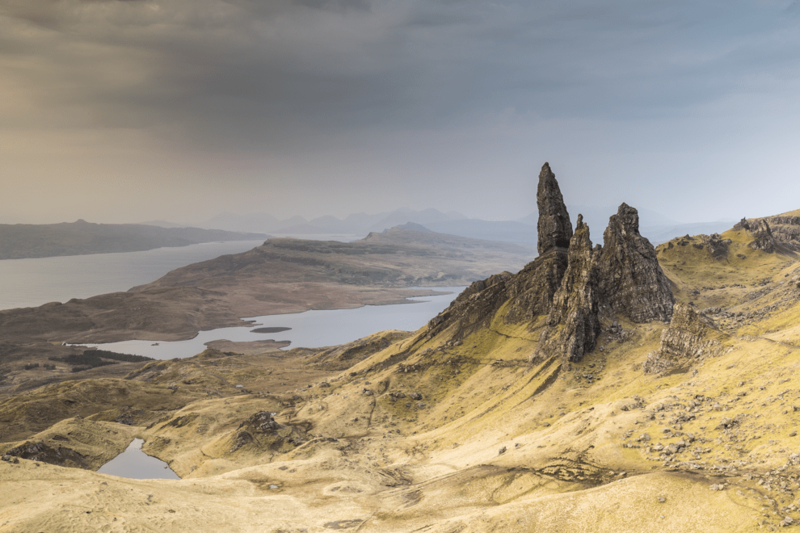 Location Co-ordinates: 57°27’31.62″ N 6°10’57.239″ W.
The Old Man of Storr has to be one of the most photographed locations on the Isle of Skye. The Storr is a 160ft pinnacle rock formation on the Trotternish Ridge. It is a couple of miles north from Loch Fada. To reach this viewpoint it needs a walk of between 45-60 minutes from the car park on the A855 road. There is a well-marked path leading from the car park up toward the Storr. When you can see the bottom of the rock formation follow the path to the right. There are several viewpoints. The shot below was taken from a small flat ‘table’ hill and gives a good view of the three rocks that make up the formation. You can also continue to the left of this hill and follow a path around the ridge where there is a higher view. If you don’t have a head for heights this probably isn’t the best route. This is very much a dawn location as it is totally in shadow at sunset. To get to the viewpoint in time for sunset you will either need to camp overnight on the top of the hill or alternatively walk up in the dark. The path upwards, whilst marked, is very rocky so make sure that you have a strong head torch to help you to the top. I was lucky on the day of this photograph to only have two very pleasant German photographers with me at the top. At other times of the year, it could be packed at the top of this hill so get there early. This is hopefully one of the less familiar locations on this photography tour of the Isle of Skye. The Hill of the Red Fox is the peak on the left of the photograph below. Its Gaelic name is Sgùrr a’ Mhadaidh Ruaidh. 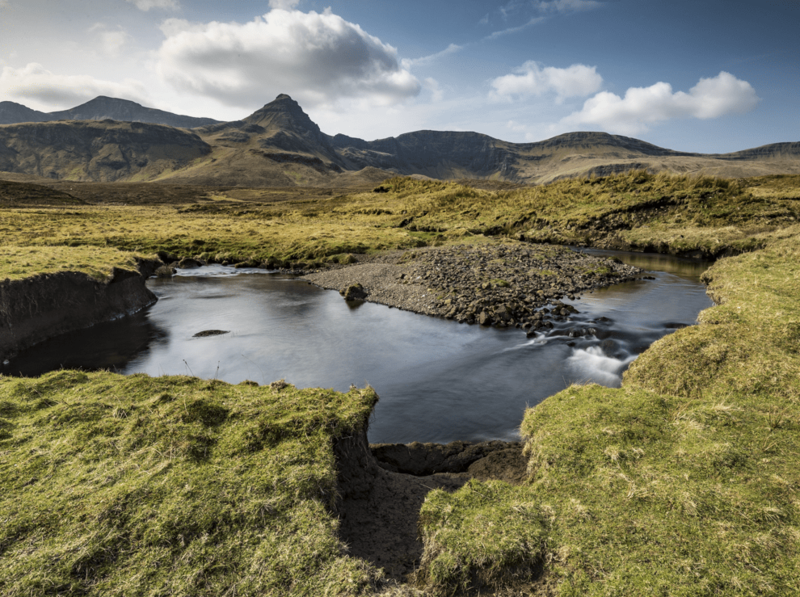 The river, Abhainn An Lethuillt, in the image flows around the base of the Trotternish Ridge and flows into the sea at the Lealt Falls. To reach this location you will need a car with a good suspension. On the A855 you will see a sign for the village of Lealt, follow this road for about 2 miles and find a passing place which still allows other cars to pass. If you continue down this road further, there is also the beautiful Loch Cuithir which also has great views onto the Hill of the Red Fox. This is one of the locations that you’ll miss if you are looking for one of the familiar locations. It is across the road from the car park which gives a view of Kilt Rock. There is a small parking area on the left-hand side of the road driving from Portree. 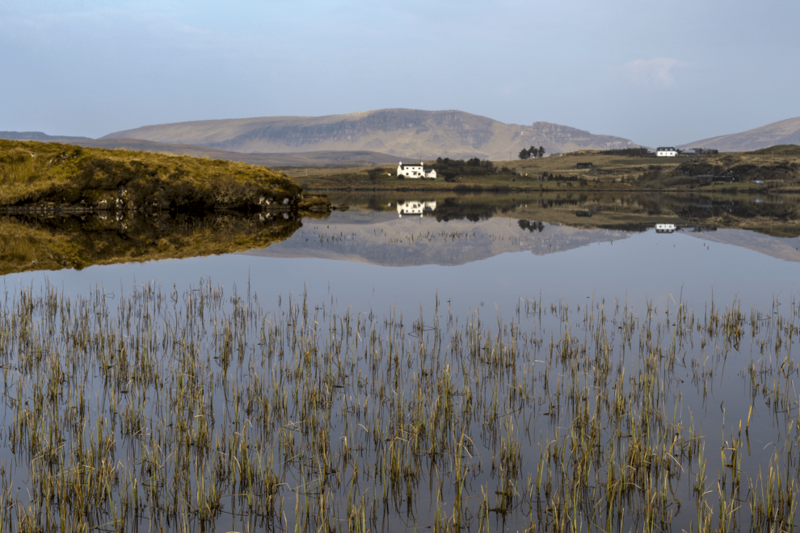 A small hop over a fence and you can get this view over the reeds in the loch toward the Trotternish Ridge. Whilst you are around this area, there is also a small café and art gallery called The Skye Blue Gallery which is run by a photographer, Lynne Douglas. Lynne was particularly helpful in giving me some tips for a few of the locations on this trip. If you are passing by, pop in and have a coffee and a cake (I can massively recommend the Jaffa Cake muffin!). Duntulm Castle was one of the recommendations from Lynne and one we visited twice. The first view of the castle looks over Tulm Bay. The castle is on top of the hill to the left of the image with Tulm Island in the middle of the bay. To reach this view, park in the carpark of the now-closed Tulm Hotel, just off the A855 and it is a short walk down to the shore. The second view of the castle, taken the following morning is from the rocks which sit below the castle. To get to this location there is a small car park that can hold around seven or eight cars at a large left-hand corner on the A855. There is a walking path that can take you to the castle. However, just before you reach the castle, there is an area of flat grass. Walk over this and there is an easy way to get onto the basalt rocks where you can get many interesting views of the castle. 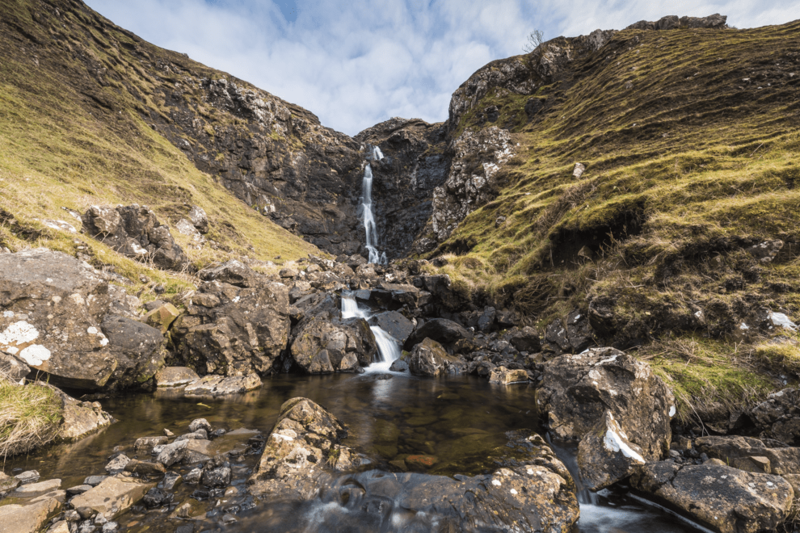 Visitors to the famous Fairy Glen, close to Uig, will probably have seen this waterfall. Standing at the Fairy Glen, if you look across Glen Uig northwards there are two waterfalls visible. This is the one that will be on the left looking across the Glen. Fortunately, there isn’t a path from Fairy Glen to the waterfall so it is surprisingly one of the least photographed features on Skye. If this were Iceland, there would probably be a café and car park to access these falls. To get to the falls, you need to leave Uig heading southwards and take the first left turn after Rankins Shop on the A87. Follow this road until you get to a farm gate blocking the road. The single-track road is extremely steep and windy so be prepared. Once you get to the gate, continue by foot and walk along the path until you see a steep path on your right going down into the valley. At the bottom of the path, you’ll need to clamber over a few rocks to reach the foot of this un-named waterfall. There were many primroses growing on the banks of the burn which we took great care to avoid standing on them. Because of these delicate flowers, we have nicknamed them, the Primrose Falls. That concludes the first part of the three-part guide to the Isle of Skye. Next week we will look at four locations on the west of Skye. All the images from this blog are available to buy as framed limited edition prints. If you are interested in photographing the West coast of Scotland, why not join us on the West Highland Landscapes workshop between 25-27th October? You can also subscribe to our monthly newsletter which contains exclusive content for subscribers.